How Is Chlordane Applied to Kill Termites? Chlordane is a mixture of chemicals once widely used for insect control in the United States. 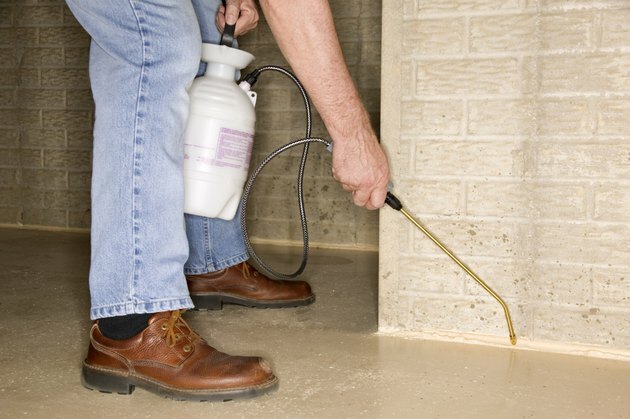 Though it's no longer used for termite treatments, the chemical may still be in your area. Chlordane is highly persistent in soil–enough to keep some homes free from termite infestation for decades after treatment. Unfortunately, this also means that its toxic side effects persist as well. Knowing how chlordane was used could help you avoid possible health problems later. Chlordane belongs to a group of chemicals referred to as organochlorines. This group also includes DDT, heptachlor and other chemicals now known for toxic side effects. The chemical works by inhibiting particular neurotransmitters and enzymes in insects, disrupting their ability to function normally. It works whether the termites ingest it or come into physical contact with it. Chlordane is a thick liquid that cannot be dissolved in water. It was often mixed with emulsifiers to create a milky mixture and applied to the soil around infested homes. Getting the chemical into the soil could be a labor-intensive process. Powerful drills were required to penetrate concrete floors and foundations in homes, so chlordane could be applied to the soil underneath. An unbroken barrier was required to keep termites out of the home. Chlordane has been linked with nervous system, digestive, and liver problems in humans. Swallowing the chemical or breathing high concentrations of it may cause convulsions, cramps, weakness, vision problems and death. Chlordane is also considered a carcinogen, though the International Agency for Research on Cancer (IARC) states its carcinogenicity is not classifiable. Fortunately, the low levels of exposure most people have are not likely to cause serious health problems. Chlordane is extremely stable in the environment. This makes it a highly effective form of termite control, but also means it remains a hazard long after exposure. People digging near the foundations of buildings which were treated in the past could be exposed to the chemical. Children who play near contaminated soil and people who eat fish and shellfish from contaminated water are also at risk. Chlordane is banned in the United States, but is still produced for international export. Formulations containing the chemical are still available in countries that have not banned its use. Chlordane is currently used for wood treatment and termite control. While the Environmental Protection Agency limits the amount of chlordane that industrial producers can release in waste water, and Occupational Safety and Health Administration regulates chlordane levels in workplaces, there is still a slight risk of exposure.